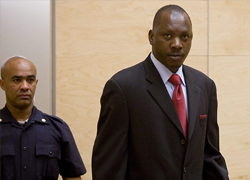 On March 14th, the International Criminal Court (ICC) delivered it first judgment, finding Thomas Lubanga guilty of three child soldier war crimes offenses. The verdict is a welcome victory in the fight against impunity and it is some measure of justice for the 60,000 persons killed in the Ituri province in Eastern Congo. But the judgment highlighted the ICC’s painstakingly slow pace to date – the ICC has been in existence for ten years and so far they have indicted 15 persons and achieved one conviction. And it should be noted this is not a final conviction, but only a trial verdict. To be fair, three other accused are in the midst of trials. Just how much have these 15 indictments and lone conviction cost the ICCs signatories? The cumulative total of the ICC’s budgets over the initial decade is $900 million. By way of comparison, the International Criminal Tribunal for the Former Yugoslavia (ICTY) spent $695 million in its first ten years, and the International Criminal Tribunal for Rwanda (ICTR) spent about a $1 billion. So at a glance the ICC is not out of line with its brethren institutions. However, the ICTY and ICTR both indicted far more suspects for that money. The ICTY indicted 161 persons, 1 while the ICTR indicted 91 persons.2 I didn’t have time to research every indictment, but my memory was that most of those indictments had been issued by the ten year mark. Let’s break those numbers down a bit more. Based on the numbers above, the cost per suspect indicted at the ICTY, regardless of the outcome of the case, was $4.3 million, it was $11 million at the ICTR and $60 million at the ICC. I am not going to address the overall cost of international tribunals in this blog. Suffice it to say that they are too expensive and too inefficient in my view. What I would like to talk about here is the ICC relative costs to the ICTY and ICTR ad hoc tribunals. While we can expect that the ICC will approach the cost structures of the ad hocsover time, the ICC will never be able to match their operational costs (particularly the lower ICTY costs) for several reasons. Second, the ICTY and ICTR both had clear and specific mandates — to prosecute those most responsible for offenses in defined conflicts. The ICC, on the other hand, has a global mandate with an obligation to consider crimes committed in any of its 139 signatory territories plus any others referred to it by the Security Council. The ICC gets thousands of unofficial communiques each year. It must conduct a cursory review of these communiques regardless of whether it decides to launch an official investigation. Third, the ICTY and ICTR had one-time ramp-up costs and learning curves. The ICC goes through this ramp-up process for each official investigation. The ICC must establish information and logistical beachheads in each situation, creating an investigational infrastructure for each official investigation. Key witnesses have to be located, relationships formed and nurtured and local politics mastered. Even small details such as safe hotels for accommodation have to be sorted out. Fourth, the ICC’s broad mandate brings with it an immense problem of language. The two ad hoc tribunals had to contend with difficult regional languages – Kinyarwandan in Rwanda and several Balkan languages in Yugoslavia. The ICC is obligated to function in all of the languages relevant to the conflicts it investigates: there are 200 languages are spoken in the Congo, 72 in the Central Africa Republic, 45 in Uganda, 142 for Sudan, 79 in The Ivory Coast and 69 in Kenya. The ICC could breathe easy with Libya where only 9 languages are spoken. Of course, many people in the Congo speak a lingua franca, Swahili or Lingala. But many witnesses have stronger language capabilities in their local tongues. We have given the ICC a complicated mandate to achieve and it is no surprise that it is taking it a while to hit its stride. On July 4, Judge Alphons Orie had former Bosnian Serb General Ratko Mladic removed from the courtroom of the International Tribunal for the former Yugoslavia (ICTY) for disrupting the proceedings and communicating with the audience. Despite the fact that the vast majority of the coverage surrounding the hearing focused on the alleged mockery Mladic made of the proceedings, Judge Orie handled the situation perfectly, maintaining the dignity of the tribunal and silencing Mladic with admirable rapidity. Mladic appeared before the Tribunal because of alleged actions taken in a number of cities in Bosnia-Herzegovina between May 12 and December 31, 1992 that amounted to genocide — a crime punishable by Section 4(3)(1) of the ICTY Statute. He was charged with a separate count of genocide for his alleged role in the infamous massacre at Srebrenica, where 8,000 Bosniak men and boys were murdered. In addition to the two genocide counts against him, Mladic was charged with the persecution of political racial, and religious groups, extermination, murder, deportation, forceable transfer, terrorism, unlawful attacks on civilians, and taking of hostages. These counts, eleven in total, represent violations of the ICTY Statute, crimes against humanity, and violations of the laws of war. Mladic was charged in his personal and superior capacity on all counts. It is clear that Mladic was highly disruptive at the hearing. 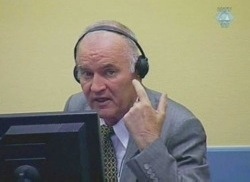 Judge Orie began the hearing by admonishing Mladic for his non-verbal communication with members of the audience at his initial appearance a month before. No less than five minutes after the admonition, Mladic could be seen gesturing to the audience, at one point giving the the crowd a smiling thumbs up. Throughout the first part of the hearing, Mladic interrupted Judge Orie several times. Judge Orie warned Mr. Mladic that if Mladic continued his disruptive course, he would be removed from the chambers. As Judge Orie started reading the first genocide count, Mladic interrupted boisterously and was promptly removed from the tribunal. While there is no question that Mladic was in fact disruptive, an interesting question arises as to the explanation for Mladic’s behavior. Essentially, there are only two possible theories: either Mladic did not understand the nature of the proceedings, or his outrage was simply false. In the end, the legal reality surrounding Mladic’s initial appearance strongly suggests that the latter explanation is the more accurate one. Mladic’s hearing on July 4 was an “Initial Appearance” under Rule 62 of the ICTY’s Rules of Procedure Evidence (RPE). As such, the sole purpose of this hearing was the formal reading of the charges against the accused and an initial, though non-binding, entry of the accused’s plea. If the accused pleads not guilty, the Registrar sets a date for the trial, and if the accused pleads guilty, the Registrar sets a date for the pre-sentencing hearing. It bears repeating that this initial plea is non-binding and that pleas have been changed before at the ICTY. Here, Mladic’s principle (and only) complaint against the Tribunal was that his chosen counsel, Milos Saljic of Belgrade and Alexander Mezyaev of Russia, was not present in the chambers. This is an extraneous, if not erroneous, complaint because it is difficult to imagine a scenario in which Mladic would plead guilty to any of the charges levied against him. Moreover, Mladic had already spent considerable time with Saljic, he does not know Mezyaev personally, and he spoke of his desire to “draft a legal strategy,” which seems to imply a not guilty plea. Thus, it appears that cynical legal strategy led to his behavior before the tribunal. There are two clear tactical advantages to Mladic’s behavior — one failed entirely and the other fell short, both thanks to Judge Orie’s prompt ejection of Mladic. The first strategy is a simple delay tactic. Mladic would be happy to have his proceeding last until the day of his death, and his attorney’s request for an additional month long extension before a plea is entered was a clear manifestation of Mladic’s desire for delay. We can expect more delay tactics of this sort as the proceeding moves forward. In denying Mladic’s request for delay, establishing that Mladic did not wish to enter a plea, and ejecting Mladic for his behavior, Judge Orie ensured that, at least for the time being, Mladic’s case will move forward as planned. The second tactical decision at play is Mladic’s desire to delegitimize the tribunal before which he sits. This tactic is nothing new, and accused war criminals frequently resort to delegitimization attempts out of a lack of other options. In this instance, Mladic’s attempts were largely unavailing. In fact, apart from a statement that the ICTY is “not a real court,” Mladic was unable to insert any disparaging remarks into the proceedings. 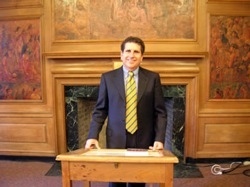 Judge Orie is to be commended for his handling of the situation, which led not only to a speedy administration of justice but also upheld the dignity and decorum of the tribunal in the face of a subject whose lack of self-awareness made him uncooperative to the point of apparent immaturity. The media coverage of the hearing focused on the ejection itself, due in large part towards its “bias in favor of conflict and sensationalism“. In reality, the conflict was dampened at every turn by Judge Orie’s handling of the matter.